The angulation of the hip bone attachment is different between men and women; a man’s will allow his leg to hang straight down naturally. I often find that many people are much more concerned about how their saddle fits their horse (which of course they should be) than how the saddle actually works for them. Beyond ‘feeling comfortable’ not much attention is usually paid to the other anatomical requirements of the rider when the saddle is being designed or fitted. As information and knowledge is gained about the differences in people’s bodies, saddle fitters have tried to use this information to better fit the saddle to the rider. Many things can affect fit to rider: pelvic tilt, seat bone width, and weight carriage are a few. In this article we will address the ramifications of the ratio of upper leg length to lower leg length and how it affects the placement of the stirrup bar. In most women the upper leg is longer than the lower leg. In most women the upper leg, measured from the top of the pelvis to the side of the knee, is longer than the lower leg, measured from the side of the knee to the floor. While this may sound like an irrelevant issue, the ratio of upper leg to lower leg can actually affect the way that the rider’s leg falls on the horse. Since for most men these lengths are pretty much equal, their legs tend to naturally fall straight down from the hip. The stirrup bar acts like a fulcrum, from which the stirrup leather hangs – forming a pendulum on which your body weight is carried when you put weight into the stirrup. Gravity always wins, so if that stirrup bar is located too far ahead of the rider’s hip, the stirrup bar, acting as a pendulum, swings the lower leg forward so that the stirrup leather is perpendicular to the ground and the rider ends up in a chair seat. Often a rider can counteract this when their weight is on the seat of the saddle, and therefore they are not dependent on the stirrup bar to balance. However, when the rider’s weight goes into the stirrups (rising trot or two point) the lower leg will swing to the stirrup leather’s resting position. In rising trot the lower leg will swing back and forth against the horse’s side, possibly rocking the rider’s pelvis forward into the pommel. In two point the rider will fall backwards to try to balance. For some riders this will also affect the sitting trot and canter, by shifting forward the lower leg which may cause the knee to come over the front of the flap. 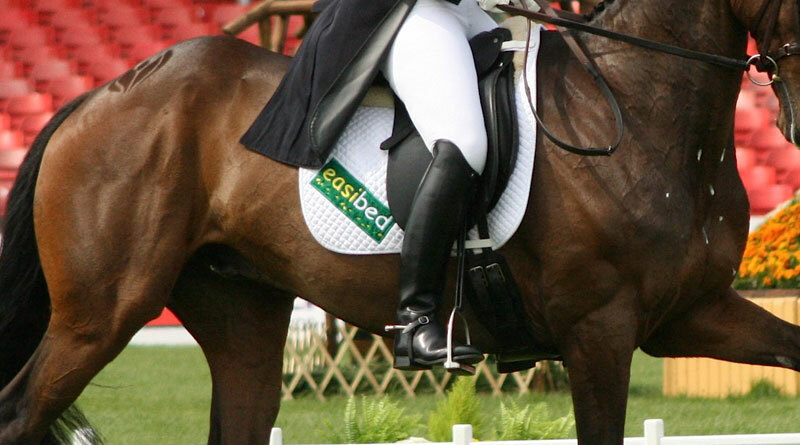 The placement of the stirrup bar and therefore stirrup leather denotes where the rider’s leg falls. In the pictures at left you can see that the placement of the stirrup bar and therefore stirrup leather denotes where the rider’s leg falls. The rider in this picture is 5’9” with an upper leg that measures 56cm and a lower leg that measures 50cm. The taller a woman is the more likely she will have a larger difference between her upper/lower leg lengths. In the first picture the stirrup leather was allowed to hang from the saddle while the rider put herself into a shoulder hips and heel alignment. As you can see, the place where the stirrup fell was well ahead of the ball of the rider’s foot. In the second picture the rider put her foot into the stirrup to illustrate the natural position this stirrup placement would put her leg into. As can be seen from the straight line coming down from her hip to her heel, the stirrup has pulled the lower leg forward. When sitting in a saddle with stirrup bars further back, as seen in the last picture, the shoulder-hip-heel alignment is natural and effortless without putting any excess strain on her hip flexor. Now she will be able to rise straight up out of the saddle without swinging the lower leg or pelvis. This is a much more balanced position. This rider has a much smaller ratio in her upper/lower leg lengths. The next rider (right) is 5’5” with an upper leg that measures 51 cm and a lower leg that measures 49cm. She has a much smaller ratio in her upper/lower leg lengths, so she does not need the stirrup bar placed as far back in her saddle. The first rider needed the extended stirrup bar in order to accommodate her longer thigh. When this rider sat in the saddle the other rider first sat in, her leg fell naturally into the shoulder-hip-heel alignment without any need to change the length or placement of the bar. A zero to three centimeter difference is normal for women 5’6” and shorter whereas a difference of greater than three centimeters is common for women 5’7” and taller. There are always exceptions to the rule but these parameters are what we usually see. Our first rider with a six centimeter difference is fairly extreme, but not uncommon for a taller woman. This is the reason why taller women will often buy a saddle that is too large for them because it is the only way to keep their knee on the flap since the stirrup bar is placed too far forward for them. When you are sitting in your saddle you should never feel uncomfortable or out of balance. When you are sitting in your saddle you should never feel uncomfortable or out of balance because you are fighting the position the saddle puts you in. When you get in a saddle and find that your lower leg is swinging, or you bump into the pommel when rising or your knee comes over the front of the flap, you may want to measure your upper and lower leg and find out if the stirrup bar is placed correctly for you. There are many other parts of the saddle which affect fit to you but the stirrup bar is important and should be measured for optimum positioning.